Stretching north-east from the Belgian-German border, the Hürtgen Forest covers an area of about fifty square miles within the triangle formed by the towns of Aachen, Duren and Monschau. From September to December 1944, 120,000 American soldiers advanced upon the Germans through this forest. Other battles in World War II have been more dramatically decisive, but none was tougher or bloodier. Close-ranked fir trees, towering 75-100 feet made the Hürtgen Forest a gloomy, mysterious world where the brightness of noon was muted to an eerie twilight filtering through dark trees onto spongy brown needles and rotted logs. In the winter of 1944, the ground was alternately frozen hard and then slushy. Snow covered it in deceiving peacefulness. Beneath the snow lay a network of ingenious booby traps and mines. The infantry had to take it. It was simply American men against German steel, and the cold, bitter weather. There was no more deadly fire, from the viewpoint of the infantryman, than that which burst in treetops and exploded with all its hot steel fury downward to the ground, shattering minds and bodies. 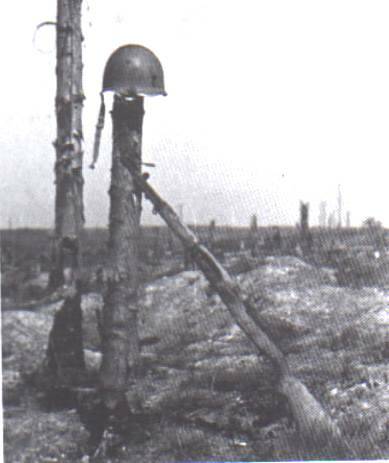 Men quickly learned that the safest place when mortar or artillery fire hit treetops, was to "hug a tree". The following American infantry divisions - the 1st, 4th, 8th, 9th, 28th, 3rd Armored, 78th and the 83rd - fought in the forest. The 9th Division, in effect, fought there twice. Numbers of supporting tank, tank-destroyer, cavalry, chemical, medical, and artillery units, also fought in the forest. Approximately 120,000 Americans, plus individual replacements augmenting that number by many thousands fought in the battle. More than 24,000 Americans were killed, missing, captured and wounded. Another 9,000 succumbed to the misery of trench foot, respiratory diseases and combat fatigue. In addition, some 80,000 Germans fought in this battle and an estimated 28,000 of them became casualties. What was gained in this battle? The Americans conquered 50 square miles of real estate of no real tactical value to future operations, and they had destroyed enemy troops and reserves, which the other side could ill afford to lose. The Germans, on the other hand, with meager resources, had slowed down a major Allied advance for 3 months. At the end of November, vital targets, dams along the Roer River, the importance of which were not realized until late in the fighting in the the Battle of Hürtgen Forest, were still in German hands. Had the First Army gone for the Roer River Dams early in the fighting, there would have been no battle of Hürtgen Forest. That men must die in battle is accepted, and some fighting will always be more miserable and difficult than others. If there had been a push directly from the south to take the Roer River Dams, the cost of lives could have been just as costly. However, if that had been done, at least the objective would have been clear and accepted as important. Those who fought in the Battle of Hürtgen Forest fought a misconceived and basically fruitless battle that could have, and should have been avoided. That is the real tragedy of the Battle of Hürtgen Forest. This website has been developed for those who may not have heard of the Battle of Hürtgen Forest or for those who simply want to learn more about the battle. There are a few very good books and other reference materials that give great details about this important battle. We have included suggested materials in the reference material pages of this website. One of the best, short articles that, in my opinion, best captures the essence of the story is that written by General James M. Gavin, and published in American Heritage, December 1979, Volume 31/Number 1. If you would like to read this article, please click the box below.